WASHINGTON (AP) -- Americans would have to sign up for a new military draft after turning 18 if the incoming chairman of the House Ways and Means Committee has his way. Democrats will control the House and Senate come January because of their victories in the November 7 mid-term election. 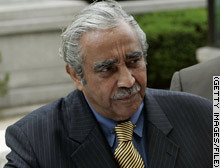 At a time when some lawmakers are urging the military to send more troops to Iraq, "I don't see how anyone can support the war and not support the draft," said Rangel. He also proposed a draft in January 2003, before the U.S. invasion of Iraq. "I think we can do this with an all-voluntary service, all-voluntary Army, Air Force, Marine Corps and Navy. And if we can't, then we'll look for some other option," said Graham, who is assigned as a reserve judge to the Air Force Court of Criminal Appeals. Rangel and Graham appeared on "Face the Nation" on CBS. Rangel, the next chairman of the House tax-writing committee, said he worried the military is strained by its overseas commitments. "If we're going to challenge Iran and challenge North Korea and then, as some people have asked, to send more troops to Iraq, we can't do that without a draft," Rangel said. He said having a draft would not necessarily mean everyone called to duty would have to serve. Instead, "young people (would) commit themselves to a couple of years in service to this great republic, whether it's our seaports, our airports, in schools, in hospitals," with a promise of educational benefits at the end of service. Graham said he believes the all-voluntary military "represents the country pretty well in terms of ethnic makeup, economic background." Outgoing Defense Secretary Donald H. Rumsfeld told Congress in June 2005 that "there isn't a chance in the world that the draft will be brought back." The military drafted conscripts during the Civil War, both world wars and between 1948 and 1973. The Selective Service System, an agency independent of the Defense Department, keeps an updated registry of men age 18-25 -- now about 16 million -- from which to supply untrained draftees that would supplement the professional all-volunteer armed forces. Rep. Charles Rangel said Sunday that he plans to propose a measure creating a new military draft in order to deter future wars.